Version 0.2.0 is now available! Read about the new features and fixes. For more details on installation, check the download page. This is an alpha preview. Please report the bugs you inevitably find via GitHub. Reaticulate is free and open source. Follow the instructions over over on the download page. Reaticulate builds upon Reabank files by extending the semantics of a program change to trigger custom events needed to switch articulations. 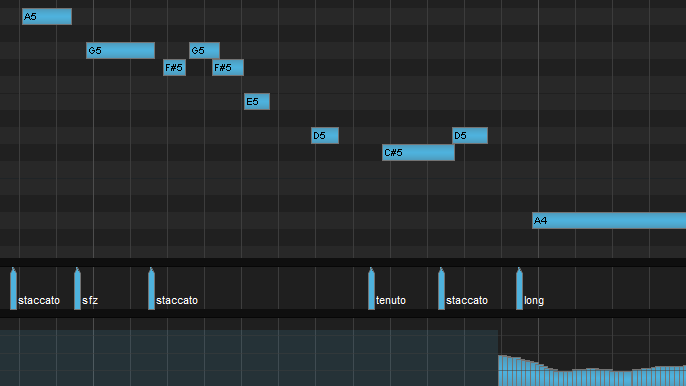 By leveraging program changes as the unit of articulation control, we get program chasing and a readable view in the MIDI editor (as seen above) for free. When articulations are spread across multiple destination channels, Reaticulate prevents note hanging and ensures that CCs are properly chased. There’s a lot more on the usage page. 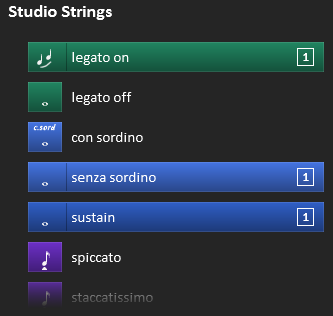 The Reaticulate screenshot to the right shows multiple banks associated with the track which hosts a Kontakt instance containing all the combination patches for Spitfire Chamber Strings Violins I. (These are all available in the distributed factory banks.) As with all Reaticulate factory banks for Spitfire Audio, they expect the Spitfire patches to be set to Locked to UACC. Then, each articulation program outputs the appropriate CC32 value to trigger an articulation change on the Spitfire patch. Reaticulate also supports up to 4 “articulation groups” per bank. A group is a set of articulations that are mutually exclusive within the group, but articulations between groups may be simultaneously active. Unfortunately at the moment there’s no GUI for configuring banks, so you’re required to bust out your trusty text editor and hack up your own Reabank file, with the special notations used to direct Reaticulate’s behavior. Click here to learn how to create your own custom banks for Reaticulate.